Figure 1: Visual spectrum at different wavelengths. Humans can only perceive 390nm to 700nm on the visual spectrum. Source: Genoa College of Fine Arts (2014) Chromatology, Available at: http://www.accademialigustica.it/blog/?page_id=58 (Accessed: 3rd June 2014). Colour of object is determined by which wavelengths of light is absorbed or reflected. 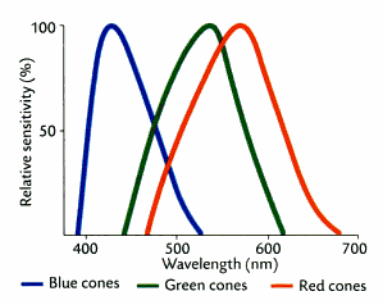 Figure 2: Three different types of cones found in trichromatic primates, including humans, have different sensitivities to light of different wavelengths. Thus forming the basis for colour vision in these primates. Source: Sjaastad O.V., Sand O. and Hove K. (2010) Physiology of domestic animals, 2nd edn., Oslo: Scandinavian Veterinary Press. Primate colour vision spectral range: 400-700nm. Diurnal birds have a larger range than primates! Genoa College of Fine Arts (2014) Chromatology, Available at: http://www.accademialigustica.it/blog/?page_id=58 (Accessed: 3rd June 2014). Jacobs G. H. (1983) 'Colour vision in animals', Endeavour, 7(3), pp. 137-140. Mancuso K., Hausworth W.W., Li Q., Connor T.B., Kuchenbecker J.A., Mauck M.C., Neitz J. and Neitz M. (2009) ' Gene therapy for red-green colour blindness in adult primates', Nature, 461, pp. 784-787. Sjaastad O.V., Sand O. and Hove K. (2010) Physiology of domestic animals, 2nd edn., Oslo: Scandinavian Veterinary Press. ©2014 University of Adelaide. Soo Hi Lee, Magdelene Wong, Sharon Yap. Picture Window theme. Powered by Blogger.